A study conducted in rural Tamil Nadu points out the appalling condition of women farmers, especially after the death of their husbands. Conducted in January by the Tamilnadu Federation for Women Farmers’ Rights in 13 villages across six state districts, the study reveals that a famine-like situation due to poor monsoon is driving farmers to suicide, leaving behind their widows trapped in the clutches of money lenders. The federation is a state unit of the Mahila Kisan Adhikar Manch, a rights group spread across 24 states, and espousing the cause of women farmers. A 60 per cent northeast monsoon deficit and a 19 per cent southwest monsoon deficit have created an emergency situation in Tiruvannamalai, Viluppuram, Thiruvarur, Nagapattinam, Thanjavur and Pudukkottai. Tamil Nadu is facing such a situation after 140 years, the study says. The seven-member team made the field visit between January 7 and 17, 2017. It also observed that the maximum number of suicides take place among marginal farmers, who own less than three acres of land. Drawing a connection between farmer suicides and the pathetic condition of women farmers, the team members noted that the latter face a lot of hardships after the death of their husbands. Saddled with debt burdens, widows also have to take care of children as well as elderly and disabled family members. Ironically, women farmers, whose contribution to agriculture is equal or sometimes even more than their husbands, are often ignored and not given land rights after the death of their spouses. The report raises this issue, noting that women spend almost double working hours in agriculture and other allied sectors. 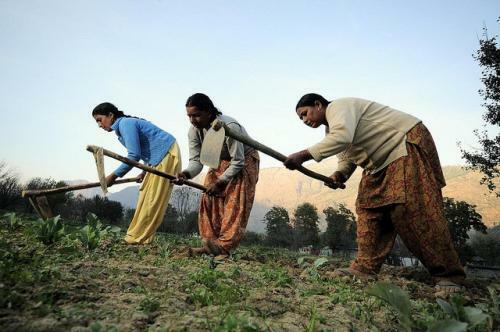 According to the study, though women constitute 74 per cent of India’s rural workforce, their engagement in agriculture is 41 per cent as against the 59 per cent of the male workforce. Women also spend about 3,300 hours in the fields during a crop season as against 1,860 hours spent by men. Besides, on-field tasks, they also look after milch animals and manage backyard poultry. The study demands recognition of women farmers so that they can be compensated after the death of their husbands, who generally own the fields. In Tamil Nadu, agriculture constitutes 7 per cent of the gross domestic product and women farmers contribute 90 per cent to this sector. In India, legal recognition of farmers usually results from land ownership. According to the 2010-11 agriculture census, only 12.69 per cent rural women have operational land ownership. As this includes land lease data, it is understandable that secure land ownership in rural India is abysmally low. Women’s low land ownership rate limits her access to government schemes, subsidies and agriculture resources. This also acts as a deterrent, limiting female participation in agriculture training programmes. As part of its recommendations, the study urges the state government to declare famine-like situation and take action on a war footing to provide food and water in the affected areas. The study also suggests the formation of a committee, including panchayat members and revenue officials, for investigating farmer suicides. It also says that wives of deceased farmers should be compensated with two acres of land having proper irrigation facility. The study also urges that the compensation should be increased from Rs 5,000 to Rs 25,000 per acre in case of crop loss.